I was sold on this version for two reasons: I had all the base ingredients in my pantry and the end result is quick. I've been doing quite a bit of baking at night lately, and that's when I ended up making these loaves - at around 10 p.m. You can't really start yeast bread at that hour unless you're prepared to be awake for four more hours, at least. The method used to mix the dough reminds me of making scones or southern biscuits. You cut the fat into the flour, then add the wet ingredients, then add the mix-ins. A wet ingredient in the recipe is ricotta cheese. It gives the baked bread moisture and richness. I made these loaves with natural orange flavoring, blanched slivered almonds and dried cranberries. The base recipe can be endlessly varied with your favorite flavoring, fruit and nut mixture. Whenever a bread recipe calls for dough to be rolled to a certain size, I always lightly flour a work surface and then draw the measurement in the flour with my finger. I patted this dough ball out to an 8x7 oval. I ended up folding the bread like the traditional yeast stollen, and it worked well. Just make two indentations in the dough with a wooden spoon handle, then fold it back onto itself accordion-style. 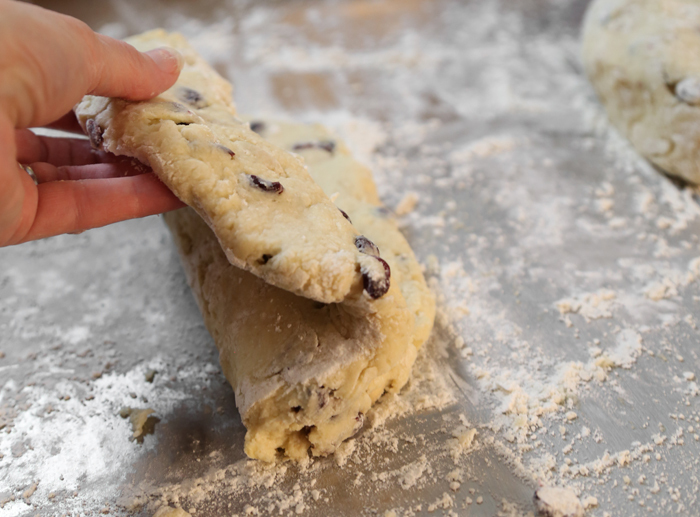 Fold the dough backward at the first crease, and forward on the second. 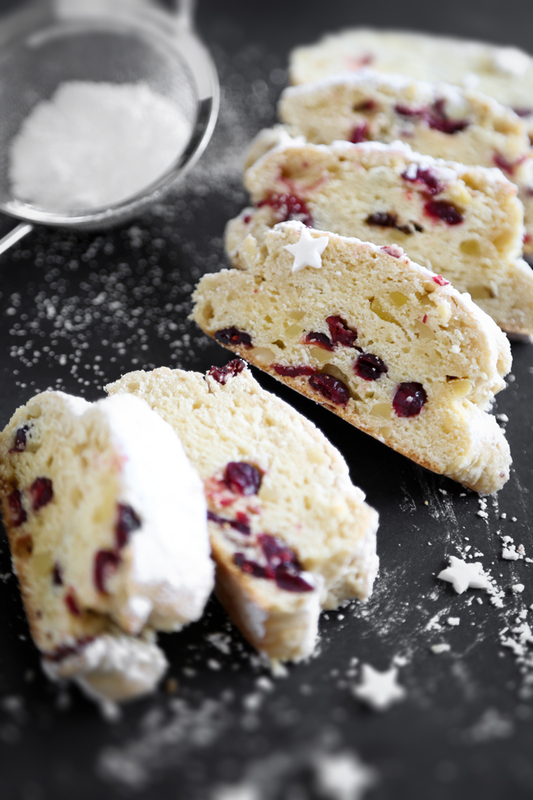 Traditional stollen has marzipan filling. If you have marzipan on hand, you could certainly pipe a line of it between the folds. I flattened the dough just a little bit after folding it. This made it lose a bit of its signature stollen shape, but having never made the recipe before I needed extra insurance that it would bake evenly (no undercooked centers on my watch!). For decoration, I punched out fondant in tiny star shapes. 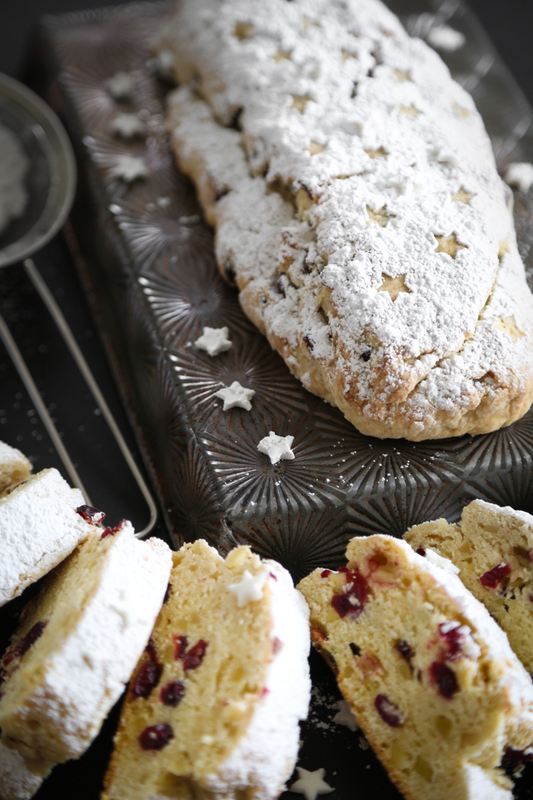 I wish I'd had marzipan because that is the usual stollen filling (next time!). I placed the stars on the bread before dusting it generously with confectioners' sugar, and then I used a toothpick to remove some of the stars to create a pretty pattern. The end result? A bread that is dense with fruit and nuts in the way my imported stollen is, yet not dry. Admittedly, the texture is different from traditional stollen (which remains on my bake list), but it's one of the best quick breads I've ever made. I especially love that it makes two generous loaves; one for our breakfast, and another for a friend. Preheat the oven to 325°F. Line a large baking sheet with parchment. Whisk together the flour, sugar, baking powder, and salt in a mixing bowl. 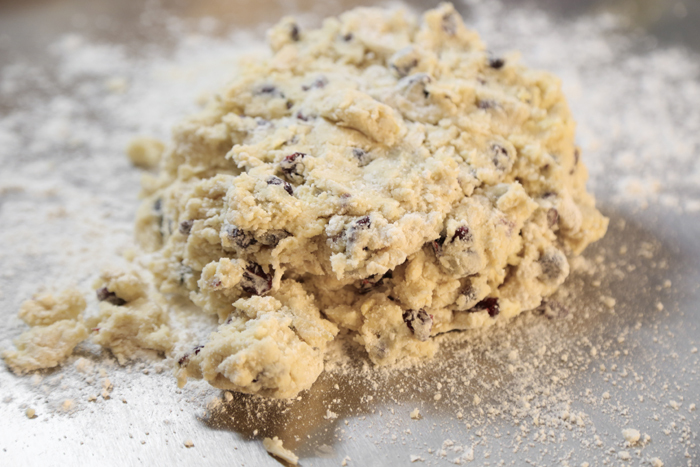 Cut the cold butter into small chunks, and then blend it into the flour mixture with a pastry blender (or a fork) to form uneven crumbs. In a separate bowl, mix together the ricotta cheese, egg, vanilla, orange extract and zest. 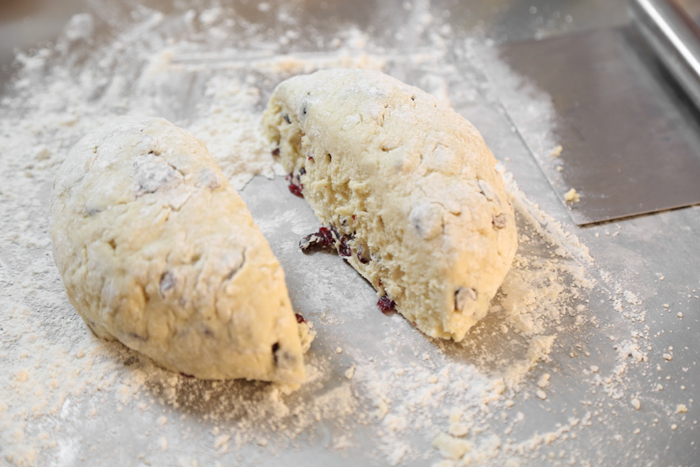 Toss the cranberries and almonds with the flour mixture until evenly distributed. Then combine the wet and dry ingredients, mixing until most of the flour is moistened. 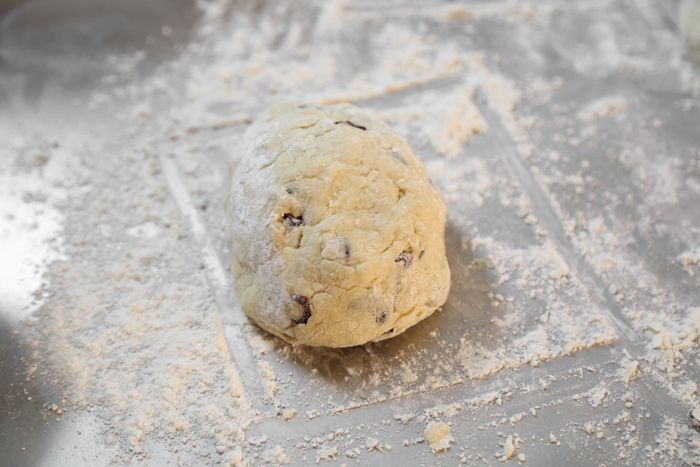 Turn the dough out onto a lightly floured work surface, and knead it two or three times, until it holds together. Divide it in half. Roll each piece of dough into an 8" x 7" oval about 1/2-inch thick. Using a wooden spoon handle, press two indentions into the rolled dough, so that the dough is divided evenly into three sections (see blog post step pictures). Don’t press all the way through! You just want to make a line in the dough. Fold the dough onto itself accordion style: fold the dough backward at the first crease, and then forward at the second. Gently press the layers together, but do not flatten loaves. 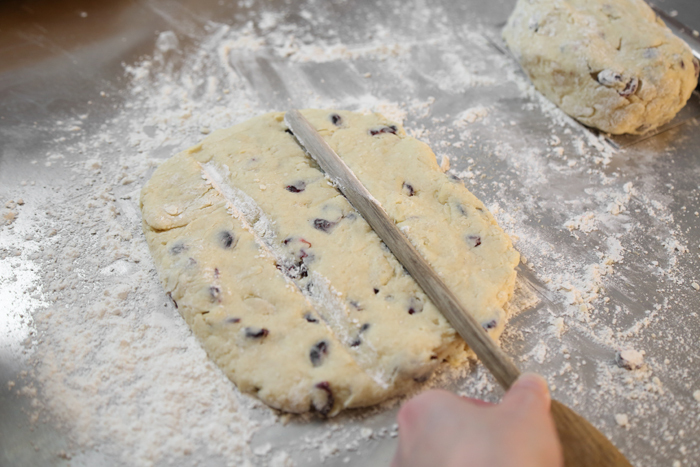 Place the shaped stollen on the prepared baking sheet. Bake the stollen till they are very lightly browned around the edges, about 40 minutes. A cake tester inserted into the center should come out clean. 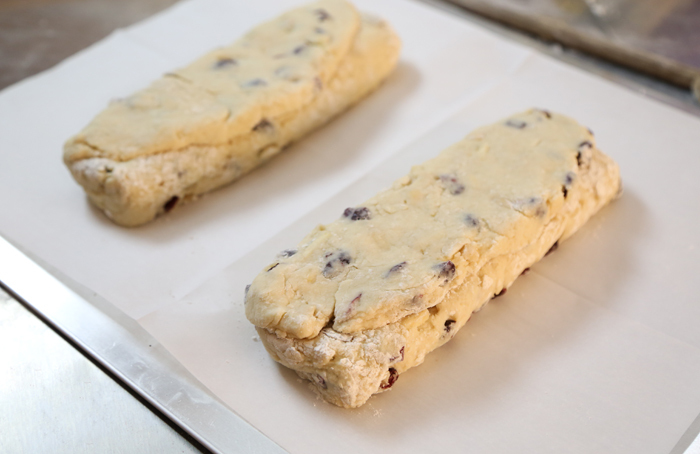 Remove the stollen from the oven, and transfer to a rack until just warm. Sprinkle heavily with confectioners' sugar. 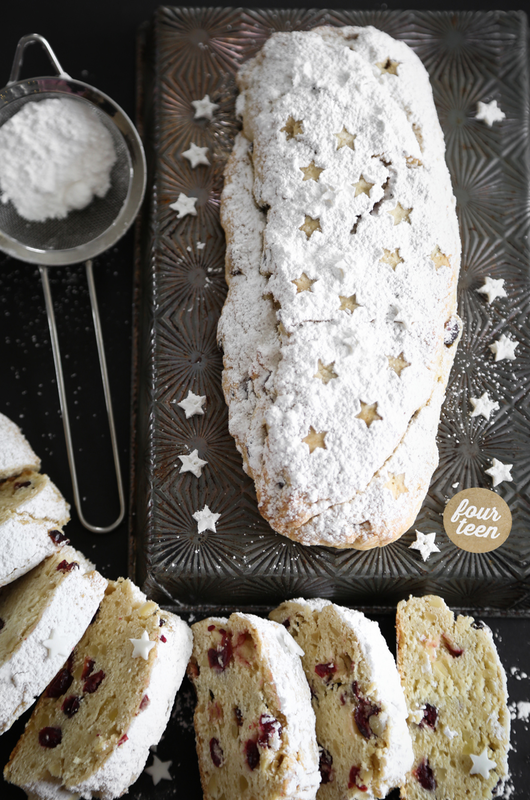 Oh this stollen looks snowy and delicious! I haven't commented on your other 12 days of giftable recipes, but I thought I should as every morning I am so excited to see what you have in store for me! Thank you for making my days brighter. I have already made the chocolate peanut butter marshmallow candy and the cranberry pistachio fudge-they both turned out incredible. This is perfect, just what I've been looking for! I'm going to make these a little smaller to give away at the office. Thanks! Love it recipe, I have to try this before Christmas! Just made two recipes of this to give as gifts. I felt like I had to sample one before I gave them away...so good!!! And very easy. Thanks! 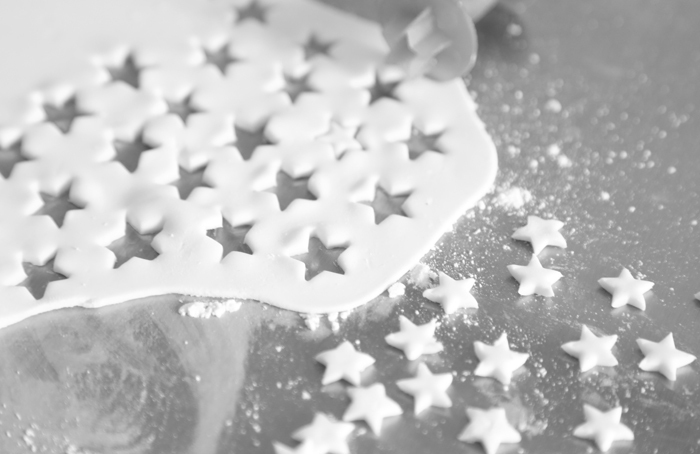 Cool decorating twist with the fondant stars. I marvel at your attention to the details.You find the most amazing moments to teach new things.